This is a post is written on behalf of Pampered Chef, but my opinions are 100% mine. One quick look around my kitchen will let you know that I love Pampered Chef. I tried figuring out how many Pampered Chef items I owned and I lost count. Yes, I own that many. After fifteen or so years I now have quite a large collection of Pampered Chef items. From the stoneware to the measuring cups and spoons, I love it all. I love to use it in my kitchen and I love to give it as gifts. When Pampered Chef contacted me recently about working with them on their Help Whip Cancer campaign, it was easy to say yes. And when I found out it involved a giveaway for my readers, the answer was definitely yes. I know you all love Pampered Chef as much as I do. Here is a little information about the Help Whip Cancer campaign and how you can help. Since the campaign’s beginning in 2000, Consultants and customers have raised more than $10.2 million to Help Whip Cancer®. Make a Difference in May and October with The Pampered Chef®! Funds raised by the Help Whip Cancer® campaign are distributed to breast cancer education and early detection programs across the country. Host a Fundraiser Show! – When you host a Help Whip Cancer® Fundraiser Cooking Show in May and/or October, up to 25% of Show sales will be donated to the American Cancer Society®. Purchase pink products! – Pampered Chef® pink products are available in May and October. We’ll contribute $1 to the American Cancer Society® for each one that you purchase. Since the Help Whip Cancer campaign is to benefit the American Cancer Society I was asked to turn one of my favorite recipes pink in support of breast cancer awareness. When I think of Pampered Chef recipes I think quick and easy. Their recipes are recipes for everyday cooking. 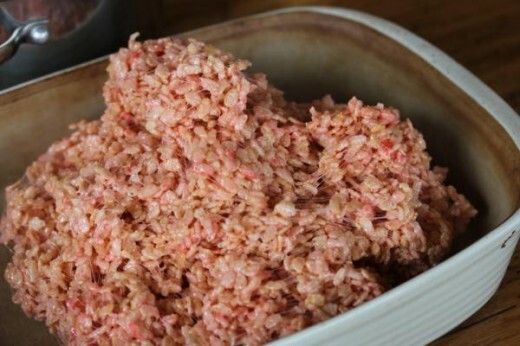 So, I knew I needed to turn one of my favorite quick and easy recipes pink. I decided to involve my kids on this one and make something fun for them. 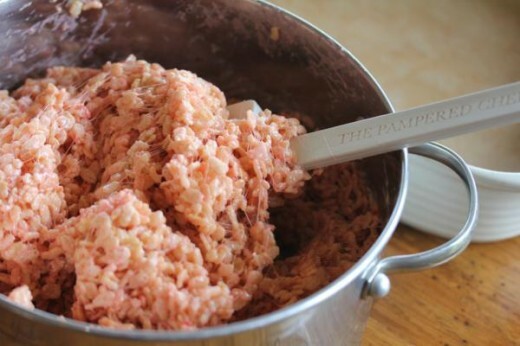 I decided to turn a favorite crispy rice treat pink. And it could not have been easier. One of the reasons I choose to make these was that it is one of my favorite things to make using my rectangular stoneware baker. The stoneware baker is nice and deep, so it makes a nice thick treat that my kids love. This is pretty much your basic crispy treats recipe with the amounts changed to fit the deep stoneware baker. And with a few drops of food coloring added. Nice and thick and delicious! Wouldn’t these be fun for all kinds of things. Parties, kids treats, etc. My girls loved them pink. In a large pan melt butter. Add marshmallows and stir until melted and smooth. Stir in food coloring. You want this a dark pink because it will lighten as you add the cereal. Pampered Chef is giving one of my readers a set of their Pink Products. Two of my favorite Pampered Chef items are in this giveaway. A paring knife and the clips. My mom gave me one of their paring knives years ago and I still use and love it. The clips, well those are good for just about anything. From bags of chips and crackers to flour and chocolate chips, I used them on everything. I think you will love these as much as I do! 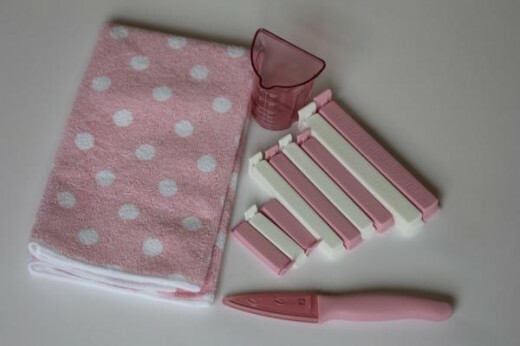 One reader will win a set of pink Pampered Chef items just like the one pictured above. All you have to do to enter is leave me a comment. You can leave any comment, but I would love to hear what your favorite Pampered Chef item is. Giveaway ends Tuesday May 14, 2013. For more details please see my giveaway policy. If you are reading this through email you must click here and leave a comment to enter. Responding to this email does not count as an entry. Disclaimer: I have been selected by The Pampered Chef to be an ambassador for their Help Whip Cancer®program. While I have received product in exchange for my post, my opinions are my own, and I have not been paid to post positive comments. My all time favorite PC product is a measure cup I ordered years ago. I don’t even know if they carry it anymore. It is great for measuring sticky stuff like honey, molasses and even really wet ingredients like mayo, ketchup,etc. I’m also a huge fan of their stones. If it weren’t for my PC can opener, we would go hungry on busy days. But when were grilling, Iwe need the rings and thermometer. Thank you for doing this. I have lost my mother and 4 aunts from Breast cancer. my sister and I have had lumps removed and I know it is just a matter of time for us. Last year my cousin (one of my aunts daughters) was also diagnosed with breast cancer. Love Pampered Chef, especially the chopper and apple peeler!! I don’t have any pampered chef so I’d love to win these. I love those Twix-it clips. Can’t ever have too many of those! I love the batter bowl. It is so versatile and works with so many things. Thanks for the chance to enter. You are asking the impossible. I cannot list my favorite Pampered Chef ITEM. However, I might be able to narrow it down to: microwave pot, hand chopper, non-stick cookware, mix n chop, all the different sized rubber spatulas, mini server, veggie peeler, large bar pan, mini bar pan (fits PERFECTLY in the toaster oven! ), herb keeper, large pizza stone….. I love Pampered Chef products! My favorite thing is the Pizza Stone. I love how cookies bake evenly on the stone. Like the batter bowl a lot, measure, mix, cover…comes in handy many times. Just had a Pampered Chef party 2 months ago as was time to get some of their new things. Love their products and the parties are such fun too. I like the measurement cups the best; have in all sizes. I love all Pampered Chef products but if i had to choose it would be the mini loaf pan. I love the Mix ‘N Chop I got for Christmas last year! I love the batter bowl & mix ‘n scraper!!! I love all my pampered chef items, older and new. Love my dicer/chopper, can strainer, measuring spoons, my stoneware, oh and the orange peelers. Love them all! I love my pizza stone and the thing that makes peanut butter slide into recipes easy!!! My all-time favorite items (nope, can’t pick just one!) are the Quick-Stir Pitchers and the veggie peeler! I don’t have many pampered chef items, but I use my chopper all the time! I have several items, and love the garlic press. I have so many favorites. I can’t pick just one. I use my Rectangle baker all the time. When I’m not using it, I use my large bar pan, my 15 inch round stones (used them tonight for pizza. I love having 2 stones in my oven when baking pizza. We have 5 children. 3 are teenagers, and often have friends over. 4 pizzas is the minimum) I also use my batter bowl, can opener, measure all cup, & bread knife very often. My favorite Pampered Chef item… the garlic press. I love that thing! I am not familiar with the Pampered Chef products, but its always good to have a paring knife handy. I love my Pampered Chef stoneware! Thanks for the wonderful recipes you share. I love their spatulas. They are kind of expensive, but they last forever! I have many Pampered Chef favorites but I use my cutting boards and spatulas the most. I have quite a few Pampered Chef items. My favorite would be the Easy Opener. I even carry one in my purse with me! I LOVE PC products too and wish I had many more! My favorite is the garlic press – I use it all the time and can’t imagine having to cut up garlic. I also like their little prep bowls – so handy for little leftovers. My favorite Pampered Chef item…….I don’t know how I can pick just one! I love the stoneware – I have many different sizes and shapes, the measuring cups and spoons, the little brown scrapers, the glass bowl & lid, and on and on…..but I think that my most valued item is the Nylon spiral whisk — I have never seen anything like it anywhere else, and it is invaluable when making gravy or cream sauces since it gets everything off the bottom of the pan. Mine was accidentally broken recently by a sweet young son, so I will need to get a new one soon. M y current favorite is my mandolin. My favorites change depending on what I’m cooking a lot of. There are so many new items since the last time I looked at Pampered Chef! I love my mix n’ scraper, pizza stone, measure all cup, mini serving spatula, and on and on. I love my PC cookie press. The barrel is nice and big and makes nice large cookies. They are perfect for my Christmas assortments. Love, Love, Love Pampered hef. I think my favorite is the spatula. I use it to cook with in the frying pan or use it to scrape my mixing bowl. Thanks for including us in your Pampered Chef give away! I love this stoneware! I want another pizza pan! I enjoy the stone 4 mini loaf pan. I love the mini spatulas. I have two, and bought one for my mom also. I love so much pampered chef stuff. I think my favorite is the mix n chop. Log it! These are great! I have a friend 36 y.o just went through double masectomy! That would be rough! Cancer isn’t picky! Young or old, we should be grateful for our health! I have never used anything by PC, believe it or not, so this would be a great introduction to them. Thanks. I must be one of the few individuals who does not own anything by PC. From looking at the picture of the items being given away, the clips would come in handy in my household :). Favorite Pampered Chef product? That’s hard…the apple slice, the garlic press, the chopper, mandolin…the list goes on…I use these EVERYDAY. Thanks for the opportunity to win some PC stuff. My Mom’s a breast cancer survivor. I would love to win the pink set from PC! I don’t think I have anything from PC. Love pampered chef, had a pizza stone that I used not only for pizza but made the most awesome cookies with too. My beautiful Mom will be at my home for Mother’s Day dinner, she will enjoy these pink treats for dessert! I use my silicone mat from Pampered Chef for rolling out pie crust, rolling out cinnamon rolls and kneading bread dough. The stoneware pizza pan and cookie sheet are great for crispy fries and chicken nuggets. 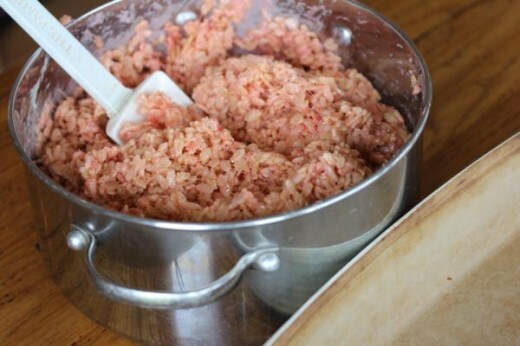 My latest love is the pampered chef meat tenderizer, I use it to crush nuts or natural sugars; it also is a great help pounding chicken into nice cutlets for baking or frying. So hard to choose just one. I love the batter bowl and the cookie scoops. I also have a piece of stoneware that is a four loaf mini pan. I love that for quick beads! I love their round pizza cooking stones…and their spatulas. I love my cookie scoop and my husband loves his ice cream scoop!!!!! Thank you for being a part of the Help Whip Cancer campaign!! After considerable thought, I’d have to narrow it down to my Mini Loaf Pans (I have FOUR…I sell Tastefully Simple and one mix makes four cute li’l loaves of beer bread, etc.! )…and I LOVE my pizza stone! I would love any product from this company. All my kitchen items were given or I bought them when we first married which is now over 30 years ago so I think it is time to replace them with some new ones! I could really use a Chefs knife though! I love my cooking spoons that my mom gave me years ago. Thanks so much for your recipes and this giveaway! I love my pitcher that has a mixer-thingy built into it! I have never tried Pampered Chef products but would like to. I love Pampered Chef and recently hosted a party. I have so many favorites, I don’t think I could just pick one. Thank you for doing this. I love pampered chef. They are very good quality. My favorite items are the paring knives and my food chopper. I don’t know if I go a day without using either one. What is your favorite Pampered Chef item? Mine is my pizza stone that I have had for 17 plus years. this would be fun to win, I like the pampered chef micro pots the little black one , I use for soups, etc in the microwave to heat up stuff. I think they are one of my favorites. I love the pampered chef apple peeler slicer corer. It makes making apple dishes so much easier! I love my p.c. bread knife-great for homemade loaves! Love the pink! Save the ta-tas! I have always loved the Pampered Chef paring knives. I recently purchased the large cutting board and love it also. I like the pampered chef pizza stone – but mine eventually broke. 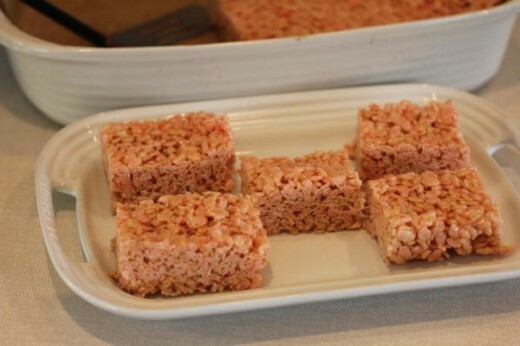 Great idea coloring the rice krispie treats! I would love to win this <3 I love your recipes!! I enjoy my large nonstick frying pan with glass lid. I cook in this so often. I think it may be 13″. I love gadgets, so probably the best gadget is the apple peeler/corer. Of course their cookbooks are great also! I love pampered chef products. Have had consultants borrow my stones to show how they “should” look after years of use. For sure the Large Bar Stone!! I love reading your blogs and your recipes – great for a busy mom! As for pampered chef – i love everything i have purchased from them, but my favorite items are my can opener (which i think i am about to wear out after 6 years of constant use) and large stone casserole dish – perfect for a family size portion of lasagna!~ So i would love to add to my collection with their pink products! And coming from a family with 4 generations of breast cancer, thank you for supporting such a great cause! I love my stoneware. I have 3 different ones and they all get used regularly. My absolute favorite Pampered Chef items are the can opener (no sharp edges) and the salad sissors – I like to use them to cut up boneless chicken breasts that I have cooked in the crockpot. Just put the chicken in a really large bowl or measure cup and chop away. Easy and fast! I can never have enough of their spatulas/scrapers – I think we have 1/2 dozen and sometimes they’re all in the wash! The Mix-n-chop, all of the stoneware, pizza cutter, egg slicer, all of the nylon tools, the quick-stir pitchers, cool and server trays, etc, etc. LOVE Pampered Chef. I’m with you on loving Pampered Chef, Lynn! My favorite item(s) are the stoneware products. Everything I bake in them from brownies, to quiche, cakes, cookies, breads, turn out wonderfully uniform in size and baked to perfection. I was just thinking about going out to their site to order a jelly roll sized stoneware piece. My favorite pampered chef products are the measuring spoons and cups. I would love to try the bread/muffin pans sometime though! I’ve heard great things. My favorite pampered chef product is the garlic press! Stoneware and can opener! I also just got the cheese knife and it is super! I love all Pampered Ched products! My favorites are the mini spatula and the garlic press. I think my favorite Pampered Chef item is the can opener with the spatulas being a close second. I don’t have any of the Pampered Chef products but have heard great things about them. I would really like to try the pizza stone. Wow, not sure I can narrow it down to just one thing. Maybe the stones, no maybe the batter bowl, no the clip, no … on and on it goes! I love the pink set and would be tickled if I were to be chosen to own it. I like the Pampered Chef paring knife. I have never tried pampered chef but I hear the pizza stone is awesome! Love Pampered Chef…pizza stone and apple peeler are what come to mind at the moment.